This article was first posted on Mind Body Green. But I wanted to give you a little bonus! At the end of this post, I’ll give you a complete checklist on how to build your day of eating as I did in this post! Well, we don’t eat “French food” every day. Those meals are mainly eaten for special occasions and on the weekends as they take a long time to prepare. And that’s the real secret here: We prepare most of our big and fatty meals ourselves. Takeaway is a no-no regarding the Sunday’s poulet fermier avec ses frites maison (farmer’s free-range chicken with homemade french fries). As it takes much more effort to craft those meals, we tend to keep them to a few times a month only, when it’s a real pleasure to cook with family and friends. As for the weekdays, meals are often easier to prepare and much lighter. I always keep in mind that health is a matter of balance. If you have a sugary snack during the day, it’s automatic for me to eat something lighter for the next meal. I have a few habits (from my mother and grandmother) that I believe are the reason I feel good in my body and in my mind. I’ll reveal a few of them below while I take you with me for a day of eating. 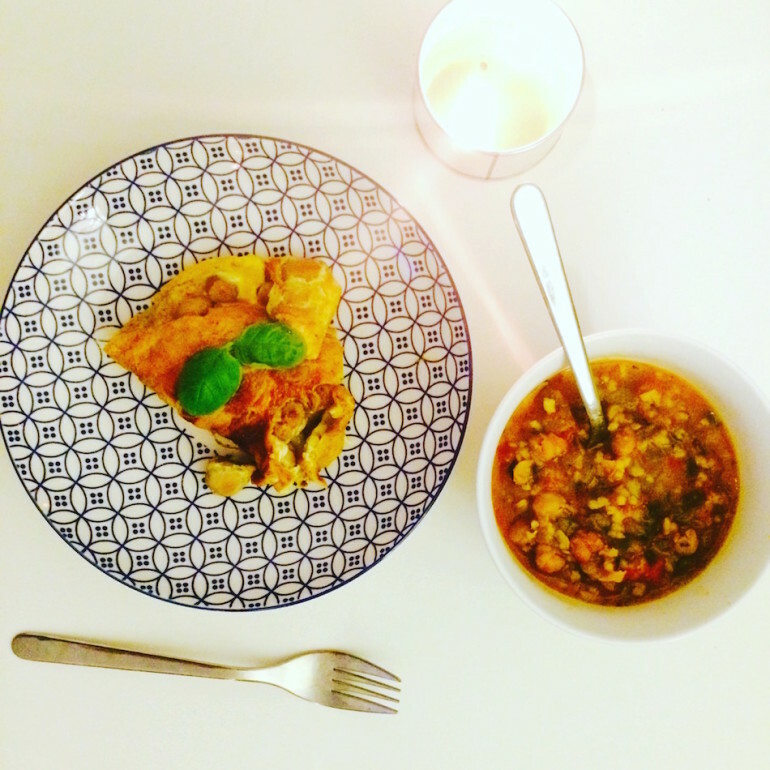 So as a busy Parisian girl, here’s what I eat in a day. As soon as I get up, I drink an eau chaude citronnée (lukewarm water with lemon juice) to quench my thirst. This is a trick from my mother to prevent catching a cold in the winter! 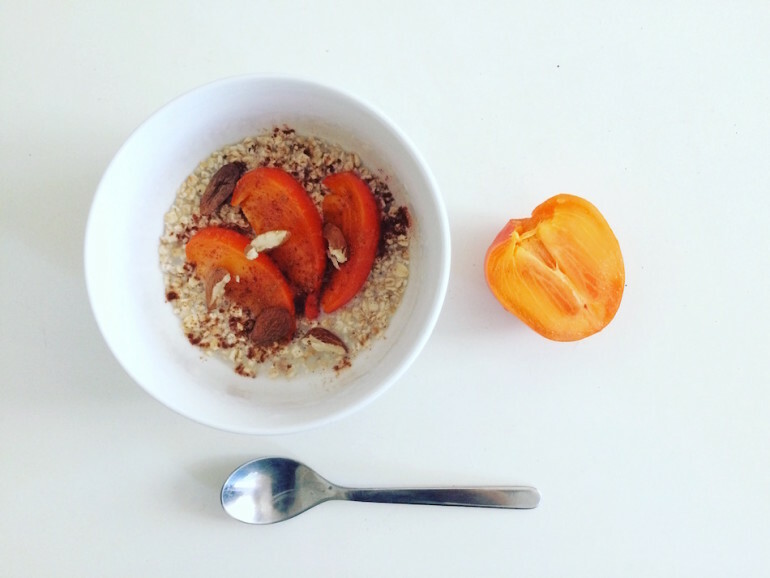 As freezing temperatures have arrived in Paris, I usually crave a hot and comforting breakfast such as porridge. I cook my porridge with whole milk, cinnamon, and fresh nuts. I rarely add sugar, as I get sweetness by adding a seasonal fruit on top of it. This week I got some wonderful persimmons at the market. As a coffee lover, I always have a cup of my favorite blend prepared with a French press. I love it black, no sugar, no milk. Try it! People don’t like black coffee mostly because it is not prepared the right way. Invest in a small French press and in good-quality coffee—freshly ground is best! Find what suits you best. Morning snack is usually either a seasonal fruit, full-fat yogurt, or a handful of freshly cracked nuts. I always have a basket of fresh nuts along with a nutcracker around in my apartment. 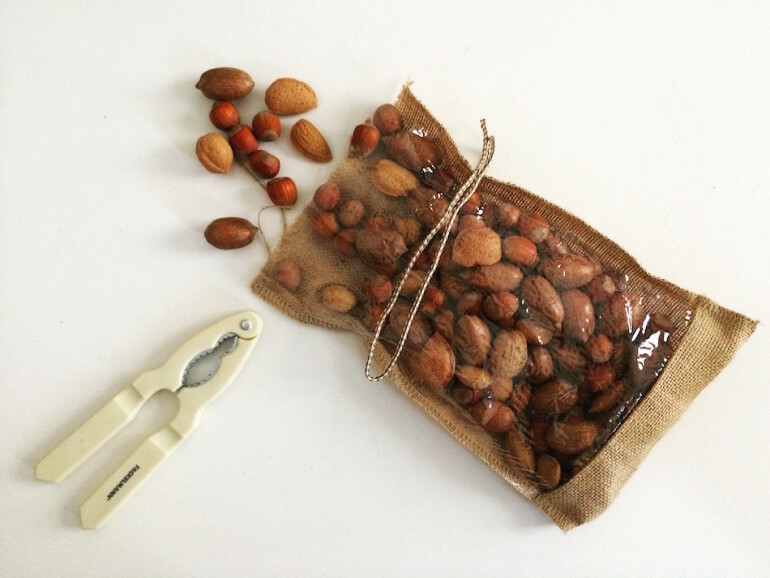 Hazelnuts, almonds, and walnuts are my favorite. Try them fresh; the taste is really different from the ones you can find in the store. Moreover, you tend to eat fewer of them as you have to put a little effort to crack them open. Lunch is most of the time a three-course meal. I take my time, stop what I’m doing, and eat with family/friends/colleagues. The portions are reasonable, and the fact that you have to pause between courses brings the “I’m full” feeling. Did you know that the average lunch of French people is around an hour to an hour and a half? The starter is usually a salad of crudités (raw vegetables) such as fresh mushrooms with a bit of crème fraîche (double cream), salt, pepper, and herbs. Main is often composed of legumes and vegetables; sometimes I add meat or fish; sometimes I don’t. 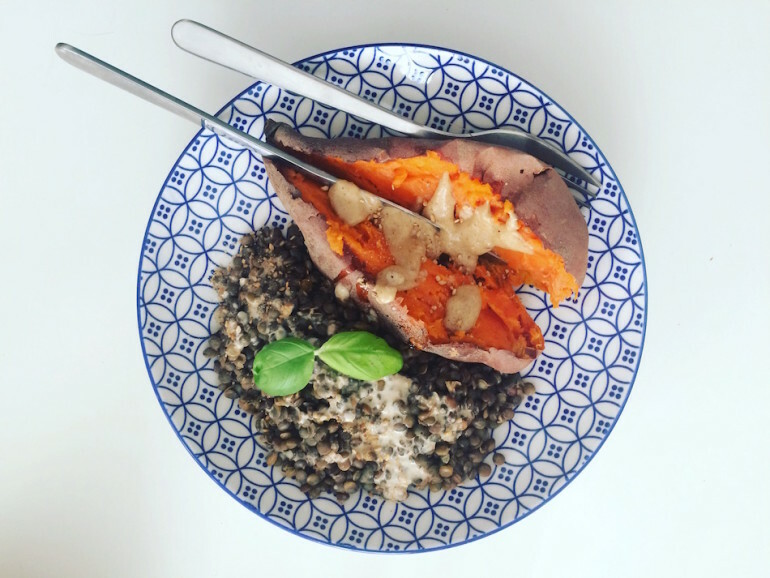 This week I tried sweet potato and lentils with tahini sauce. Dessert is usually a fruit or a plain yogurt with a dash of cinnamon. I usually take an espresso to end my lunch and get ready for the rest of the day! 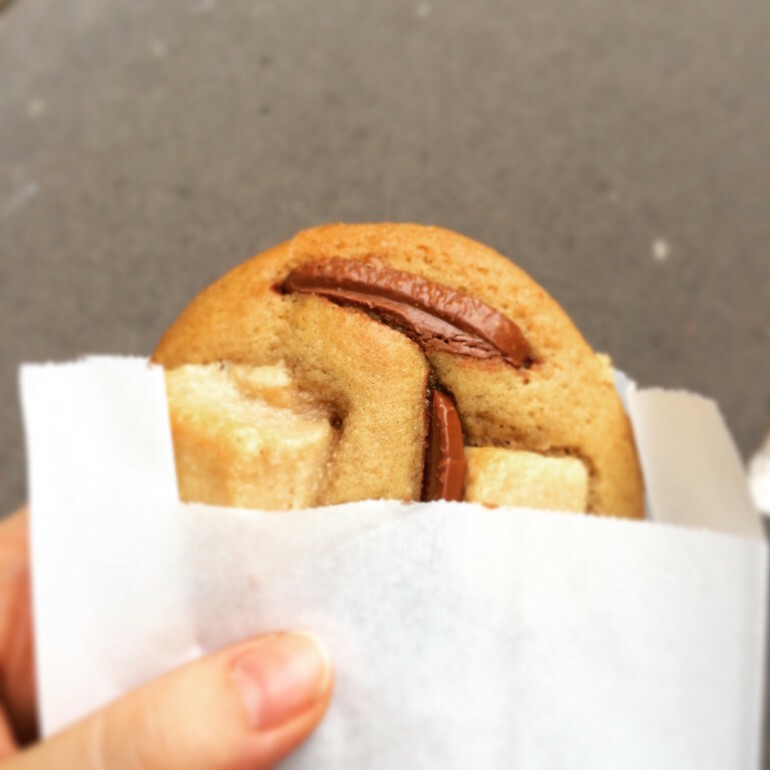 Goûter, which literally means “tasting” in English, is a memory from most of the French’s childhood. Every day, my brother and I used to finish school at 4 p.m. When we got back to the house, my mum had always prepared the table with little treats, fruits, and juice. We were allowed to take a small piece of everything on the table. That’s all. I keep this tradition of sweet treats in the afternoon, mostly on weekends. I’ll have a pastry from the bakery or a piece of a homemade pie and always enjoy it with a hot drink (tea or infusion is my favorite in the afternoon). But on the weekdays, I stick to a more reasonable goûter, which is closer to my morning snack (fruit, yogurt, or nuts). Dinner is the lighter meal of the day. Like lunch, it’s served in three courses. During wintertime, soup is always the starter of the meal. I eat it usually with a generous piece of bread (gotta have that quota of daily bread!). I make a big batch of soup on the weekend that makes it through the week (my favorite is butternut—YUM). The main meal is usually a portion of meat, fish, or a big omelet. If I feel like it, I have a salad to go with it, but generally the soup does the trick. Dessert is the usual fruit or yogurt (cheese is great as well, but I don’t really like it). 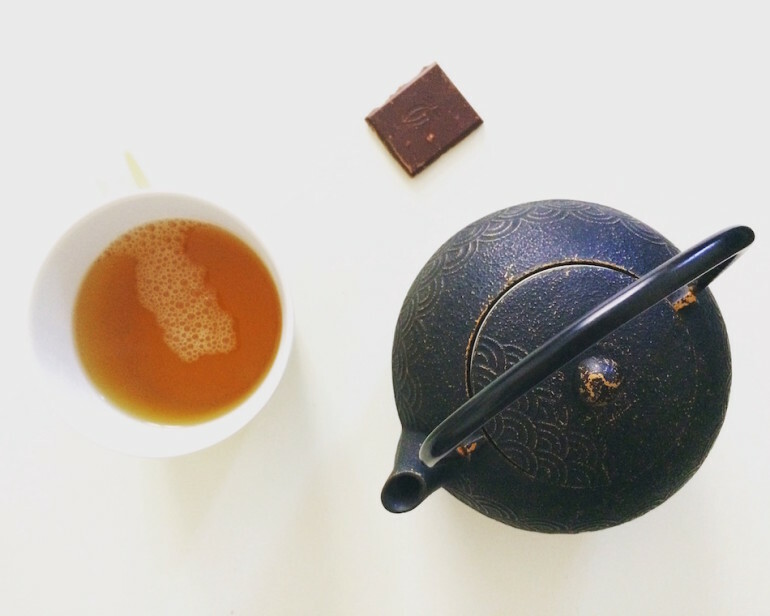 Mon petit plaisir (my little pleasure) is a piece of dark chocolate and a tisane (infusion) while watching Netflix or reading a book. And my day is complete! As you can see, I always enjoy what I eat. That is my No. 1 rule. I refuse to eat tasteless, bland foods for the sake of them being “healthy.” I’m aware of what I eat, I choose to love what I eat, but I choose smart. I prefer eating a full-fat yogurt that will satisfy my hunger and my brain than choosing the fat-free version that will leave me unsatisfied and hungry an hour later. Moreover, I try to stick to seasonal and homemade food as much as possible. This way of approaching food was worked for decades in France, and when I see how my grandmother and mother are healthy, fit, and happy, I know I’ll never ditch this way of eating! What do you think about how I build my day of eating? Do you have also your own special habits? Wow, your daily meal is really light! What if you’re about to embark in a heavy day? Like doing lots of physical things?